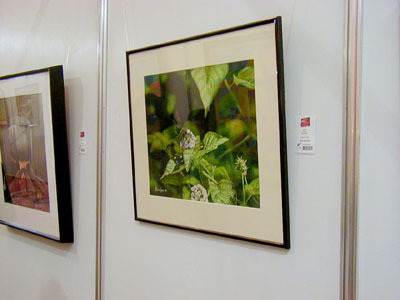 Last weekend, I was in Cebu for the Cebu Art Festival held at the Waterfront Hotel in Lahug. 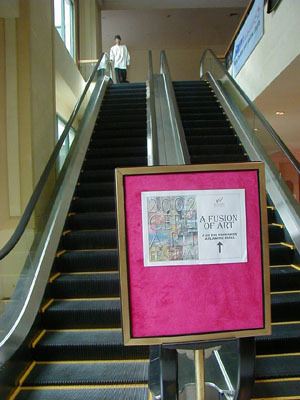 The art event was described as a fusion of art primarily because everything related to it was on exhibit there! We were also given a "treat" as top models from Cebu and Manila catwalked down Atlantic Hall's runway. Hehe! It was great mingling and talking to the other artists as well. Especially, when you talk about your influences, your styles and inspirations. Best compliment I got: "Are these your works? So you're into photography.". I answered, "No sir, those are actually a watercolor paintings.". He gasps afterwards! Hehehe! I'll be on a dawn flight tomorrow for Cebu. Yeah, this will be a quick trip. 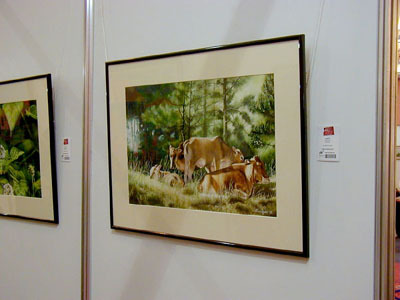 Drop the paintings for exhibit by 9am Friday, attend the Cebu Art Festival opening the next day. And be back here Sunday before football practice at 3pm in Xavier. 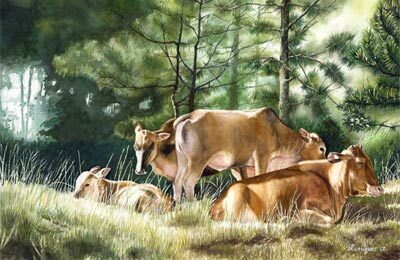 And here's the latest update on those cows... 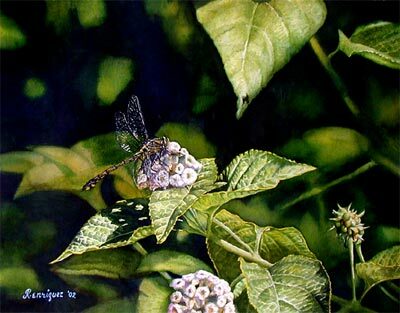 This is the final one and together with the dragonfly, they're already framed. I was in Massachusetts when 9/11 happened. A normal day in the office was broken by the ringing of phones. Friends were calling from everywhere. At first, I couldn't believe this was happening. It's like watching a Die Hard movie and everything was so surreal. Immediately, I tried to surf CNN and it was down. Little did we know that their building was also affected. Then I tried Inquirer's website, which was inquirer.net before but now inq7.net. It was up but only 3 to 4 paragraphs of sketchy reports were there but they already sufficed. Enough to tell us that everything happening was true. So my American colleagues were now surfing Inquirer ! Hehe! Then a television was setup in the conference room and we were all there with mouths agape. Words escaped me and I didn't know how to console my colleagues. We were all dumbfounded. Now one year after, we remember the victims and the heroes. Let's just hope and pray that the mankind will still keep this fight against terrorism. 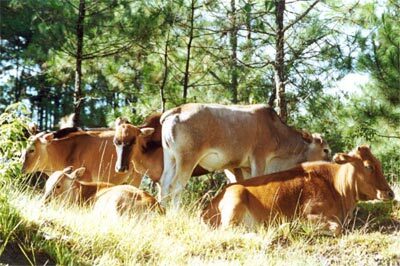 If you notice, I took the liberty of removing the fifth cow. His position wasn't contributing any good to the composition that I'm trying to achieve. 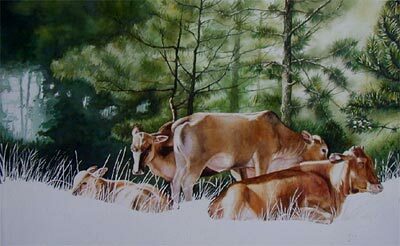 Then I simplified the busy background of pine trees so as not to distract the viewer from my subjects. 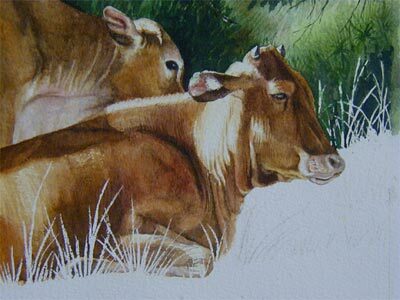 Although there are four cows, the way they're huddled together unites them as one subject matter. 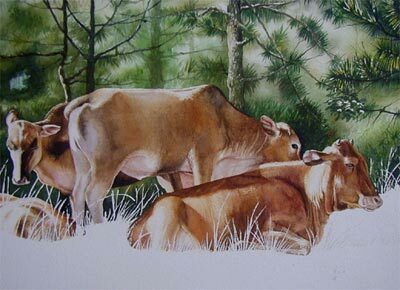 Done with the fourth cow and here are the four stooges. The painting's not quite complete though. I still have to work on the grassy foreground.